Shown here in 1997, Southern Pacific Ten-Wheeler No. 2252 is on display at the entrance to the Placer County Fairgrounds in Roseville, California. The locomotive is expected to be moved to a new, more prominent location and be cosmetically restored beginning in June 2003. In April 1956, Southern Pacific placed 4-6-0 No.2252 on permanent display at the Placer County Fairgrounds in Roseville, California. Unfortunately, as is the case with so many park engines, No.2252 has deteriorated badly over the years despite the addition of an overhead shelter to protect it from the elements. A few years ago there were rumblings that the engine was being sold to a Texas tourist railroad, and this created concern among local railfans and historians who wanted the engine to remain in Roseville. The rumors turned out to be unfounded, but some good came of it. Last year, a group known as the Community Coalition for SP Locomotive 2252 came together to relocate and cosmetically restore the engine, while keeping it in Roseville and on display for public viewing. No.2252 is one of the oldest standard gauge SP locomotives in existence, constructed by Cooke in March 1897 as Southern Pacific No. 1838, one of 38 identical Class T1 Ten-Wheelers built that year. It was initially used in in freight service on the Donncr Pass line until it was bumped to secondary service by larger power. In 1901 the Tis were renumbered into the 2200 series and No. 1838 was renumbered 2252. In May 1929, after nearly three decades of service, No.2252 was one of four Tis to be modified for "fire train" service in the northern California mountains. SP's fire trains (also called "water trains") were responsible for fighting linesidc and snowshed fires along SP's transcontinental route over the Sierra Nevada, and were assigned to Truckcc, Cisco, Summit and Blue Canyon. Theyconsisted of a pump-equipped locomotive pulling two or three water cars and were extremely important for fighting the wildfires sparked by steam locomotives. Of particular importance was the protection of the wood en showsheds at the higher elevations. For fire train duty, No.2252 was outfitted with a Duplex pump capable of delivering 300 gallons of water per minute through a 1000-foot hose carried aboard the train. The pump was fed from the water cars, which held over 7000 gallons of water each. The trains were outfitted with plenty of axes, ladders and other fire fighting equipment, and No.2252 was fitted with a steam siren that was blown when the train was under way. During the summer, the fire train locomotives were kept hot at all times and a crew was always on duty in case the call came to more out to a fire. No.2252 remained in fire train service until the early 1950s, long after most other members of the T1 class had been scrapped. It was retired only after modern firefighting methods and diesel locomotives made the fire trains obsolete. Its role as a firefighter ensured its preservation, because at its retirement in February 1956, No. 2252 and sister T1 No.2248 were among the oldest locomotives on the active roster both nearly 60 years old Stripped of its firefighting equipment, No.2252 was painted and presented to the city of Roseville in 1956, while sister No.2248 was retained by the SP for exhibition and was later sold to a collector. After a stint on the Texas State Railroad in the 1970s. No.2248 has been restored and now pulls the Tarantula tourist train at the Fort Worth & Western Railroad at Fort Worth, Texas (see "Fort Worth & Western" in the October 2001 R&R for the full story). Due to periodic rebuildings and upgrades, today No.2252 appears very little as it did when originally constructed. Its small tender was replaced with a huge "whaleback," and a steel cab replaced the wooden original. Despite several overhauls, though, it retains its as-built Stephenson valve gear and slide valves, When I photographed the engine in 1997, it wore the electric headlight that replaced its oil-burning original (the electric headlight has since been stolen). Since it appears much as it did while in fire train service, perhaps this part of its history can be showcased through appropriate signage and photographs after it's restored. No.2252 will move to a new location soon. The display site at the corner of Las Vegas Avenue and Lawton Avenue, near the entrance to the fairgrounds, is not easily accessible to the public. After considering several locations, including the Amtrak station, the Coalition has concluded that the best display site is at the corner of Atlantic and Vernon. 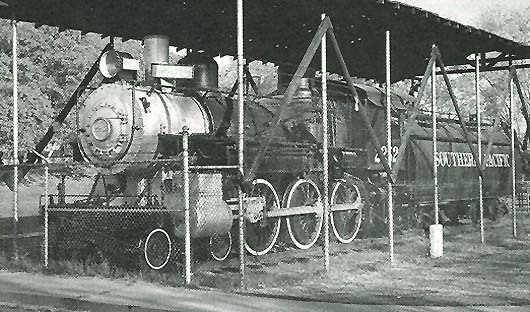 Estimates put the cost of relocating, fencing and cosmetically restoring the 4-6-0 at just over $80,000.00. The group plans to begin raising funds soon, with an anticipated relocation in June 2003, and the restoration of the engine following shortly after. Another park display engine in need of restoration is Canadian National 4-8-4 No. 6167, which has been exhibited at Guelph, Ontario, since 1967. The big 4-8-4 one of CN's U2c class "Confederations" (Nos.61656179) built by Montreal in 1940. became a celebrity in the early 1960s as a fan trip engine, and for many years wheeled excursion trains until it came due for overhaul in 1964. Its last operation under steam was on September 27, 1964. when it douhieheaded an eleven-car fan trip with 4-8-4 No.6218. which had been restored by ON to take No.6167's place. Three years later, No.6167 was placed on display near the CN Station in Guelph. Today, No. 6167 is in tough shape. Rust has eaten through the boiler jacket exposing the asbestos insulation underneath, vandals have damaged the interior of the cab and many small items have been pilfered. The years of neglect mean the 4-8-4 needs more than a paint job to look presentable again. As a result of recent public outcry over the engine's derelict appearance, the Guelph city council pledged to spend C$250,000.00 on a cosmetic restoration. Because the funding is part of the city's five year plan, work may not begin until 2007. This is unacceptable to many historically-minded citizens, including George Prytulak of the Canadian Conservation Institute who was recently hired to inspect the locomotive and make recommendations for its immediate conservation. In his report to the city, Prytulak recommended that, if the restoration is delayed, fencing needs to be replaced, the asbestos boiler lagging removed and floodlights alongside the locomotive repaired to stave off vandalism. Much more work will be needed to bring the engine back to the condition it was in at the time of its donation. This past August, Canadian National donated former Algoma Central FP7A No. 1756 to the West Coast Railway Association for display and operation at the West Coast Railway Heritage Park at Squamish, British Columbia. No. 1756 is the first of the former AC F-units to find a new home after being retired and stored after Canadian National acquired Wisconsin Central, last owner of the Algoma Central. No. 1756 was built for the Canadian Pacific in June 1953 and carried the number 4103. It was renumbered 1404 in 1954 and kept that number when it was acquired by VIA in 1978. Later it was rebuilt by VIA into an FP7Au and given the number 6553, and was retired in 1995. Several VIA F's were acquired by Algoma Central for passenger service in 1995, including No.6553, which became AC 1756. It mainly worked in passenger service during the summer tourist season but was known to be used in freight service during the winter. The AC F's were retired in 2001, and one of No. 1756's last assignments was pulling a railfan special for the C&NW Historical Society between Superior and Spooner, Wisconsin in June 2001. Stored serviceable in Chicago, it was officially retired and removed from the roster on June 10, 2002. The city of Snoqualmie, Washington, and the Northwest Railway Museum are working together to create a "community icon" in the form of a steam locomotive which will be cosmetically restored and placed on display. The local Chamber of Commerce came up with the idea as a way to identify the community as well as promote the local railway museum and its diesel-powered excursion runs, Former U.S. Plywood 2-6-6-2 No.11, a 1929 Baldwin Mallet, has been selected from the NRM's large steam collection to be painted and placed at the corner of Railroad Avenue and Snoqualmie Parkway, where it will be seen by tourists entering town. No.11 is often associated with the Northwest Railway Museum, formerly known as the Puget Sound Railroad Historical Association. The museum was founded in 1957 and acquired the Mallet in 1971 from the University of Washington in Seattle, where it had been displayed since 1961. It was built as a 2-6-6-2T for the Ostrnnder Railway & Timber Company as their No. ?, but was later sold to the Weyerhaeuser Timber Company, which removed its side tanks and added a tender converted from an 8000 gallon tank ear. In 1950 the engine moved to Resume, Washington, to become Resume Timber Company No.11, and continued in service when that company became part of the United States Plywood Corporation in 1953. No.11 was retired in the early 1960s and donated to the University of Washington for placement in front of the College of Forestry at the end of a nearby railroad spur. It went on exhibit in January 1962, but by 1971 the space was needed for college expansion. The Puget Sound Railroad Historical Association was among several groups that expressed interest in obtaining the engine. Over a period of a few months volunteers from the group replaced No.11's missing parts, lobed it and obtained a state boiler certificate which allowed them to steam up the 2-6-6-2 and run it off University property under its own power! At the museum site in Snoqualmie, No.11 was given a minor going over and placed into regular service on the Puget Sound & Snoqualmie Valley Railroad pulling tourist trains. No. 11 operated on the PS&SV until it required new flues in 1982, when it was stored while Rayonier 2-8-2 No.70 took over its passenger duties. When a boiler crack sidelined the Mikado in 1983, a decision was made to retube No. 11, and it returned to service in May 1985. Volunteers overhauled the engine's running gear between 1988 and 1989, thinking it would be useable for many more years to come. This was not to be the case, as in 1990 a pin worked loose on No.11's low-pressure engine and fell out causing major damage, including one broken connecting rod and another badly bent. Around this time, the museum was evicted from its small yard, and without a place to rebuild No.11, hopes of getting the 2-6-6-2 back into service evaporated, despite the fact that new rods had been fabricated. This page, its content, images, and data © 2004, by Carstens Publications, Inc.